Well let’s go back a bit…In the beginning God created the heavens and the earth. Now the earth was formless and empty, darkness was over the surface of the deep, and the Spirit of God was hovering over…okay, maybe that’s too far back. I’ll skip a bit. It was, like, 2005 or something. A filmmaker friend of mine wanted to collaborate on an animated short about the devil—sort of a VH1’s Behind the Brimstone sort of thing—so I got to thinking, which is what I tend to do when I want to avoid actual work. One of the nuggets I came up with was a Hell for children (thank you, Pat Benatar) that—of course—just had to be called Heck. It was loosely based on the structure of Dante’s Inferno, and the story just sort of grew organically from there. Since the subject material was so potentially bleak (even eternal darnation can still be something of a bummer), I wanted it to strike the proper tone between funny, silly, exciting, and meaningful. • Inferno (Italian for “Hell”) is the first part of Dante Alighieri’s 14th-century epic poem Divine Comedy. It chronicles the journey of Dante through the medieval concept of Hell, guided by the Roman poet Virgil. In the poem, Hell is depicted as nine circles of suffering. You are in Limbo, a place of sorrow without torment. Here, there are the virtuous pagans, the great philosophers and authors, un-baptized children, and others unfit to enter the kingdom of heaven. The atmosphere is peaceful, yet sad. Welcome to the most boring, dull, drab, awful, endless, monotonous place where you ever twiddled your thumbs and stared off into space. Limbo is like having a Time Out…forever. Everything moves soooooooo tortuously slow. But hey: at least the broken clocks are right twice a day. Now go wait in the corner and think about what you’ve done—for all eternity. Here, sinners are blown around endlessly by the unforgiving winds of unquenchable desire as punishment for their transgressions. The infernal hurricane that never rests hurtles the spirits onward. You have betrayed reason at the behest of your appetite for pleasure, and so here you are doomed to remain. Gimme gimme gimme! Didn’t anybody ever tell you that greed would get you nowhere? Well…nowhere good at least. Welcome to Rapacia: Where you could never get enough, and what you did get is now completely worthless. Remember how you swore you’d die if you didn’t get it all? Well, be prepared to hand over all the pretty, shiny, glittery things you had to possess and obsess over. It’s the price you have to pay. Greed it and weep! The gluttons are punished here, lying in the filthy mixture of shadows and of putrid water. Because you consumed in excess, you meet your fate beneath the cold, dirty rain, amidst the other souls that there lay unhappily in the stinking mud. You are what you eat…so you must be one sugary, salty mess of fudge, milkshakes, and curly chili fries with cheese! Welcome to Blimpo: Where your best friend is food and your gross lack of willpower is your worst enemy. You are all urge, and no purge. Never feel full? Get used to it—because this is one mess you can’t eat your way out of. Here, the prodigal and the avaricious suffer their punishment, as they roll weights back and forth against one another. You will share eternal damnation with others who either wasted and lived greedily and insatiably, or who stockpiled their fortunes, hoarding everything and sharing nothing. White lies, whopping lies and everything in between makes you a liar, liar, pants on fire! You want the truth? You can’t handle the truth! Welcome to Fibble: Where believing your lies makes you the best liar of all. So go ahead: lie through your smiling teeth. Lie in wait. But, above all, lie low. You’ll be here awhile. Honest. Here are the wrathful and the gloomy. The former are forever lashing out at each other in anger, tearing each other piecemeal with their teeth. The latter are gurgling in the black mud, slothful and sullen. Their lamentations bubble to the surface as they try to repeat a doleful hymn. Boo hoo. Who? You. Forever! Welcome to Snivel, where spilled milk is just one of the many things you’ll be crying about. It’s a place where the whining flows freely, and no one cares about your moaning because they’re too busy groaning themselves. Now you’re really down in the dumps: way, way down! Burning tombs are littered about the landscape. Inside these flaming sepulchers suffer the heretics, failing to believe in God and the afterlife, who make themselves audible by doleful sighs. You will join the wicked that lie here, and will be offered no respite. Your attempt to grow up too fast only made you go down, down, down way before your time. Welcome to Precocia, where the bad kids who don’t think they’re kids go. Every day is Freaky Friday where your salad days are served with a sneeze guard, meaning, no more kidding around. Ever. The violent, the assassins, the tyrants, and the war-mongers lament in the river, while centaurs armed with bows and arrows shoot those who try to escape their punishment. The stench here is overpowering. Sticks and stones may break your bones, but down here, words hurt far, far more. Welcome to Wise Acres where those with sharp tongues can cut deep. It’s the place for kids who sass back with a vengeance. So, if this sounds like you, then get ready for the ultimate war of words, and pray that you never run out of ammunition. Those guilty of fraudulence and malice are whipped by horned demons while the hypocrites struggle to walk in lead-lined cloaks. The magicians, diviners, fortune tellers, and panderers are all here, as are the thieves. The foulest of the foul. The most brutal of the brutal. Welcome to Sadia, a place where the end always justifies the mean. Here, you’ve got to be cruel to be a kid, because the golden rule is an iron-fist. Think you can roll with the punches? Well, here’s hoping you don’t bruise easily. This is the deepest level of hell, where the fallen angel Satan himself resides. His wings flap eternally, producing chilling cold winds. Sinners here are frozen deep in the ice, faces out, eyes and mouths frozen shut. Traitors against God, country, and family, lament their sins in this frigid pit of despair. Friend or faux? Welcome to Dupli-City, where every kid puts their best face forward: both of them. Treachery, manipulation, and betrayal are always in fashion. It’s a place where you’ve always got to watch your back, becomes there’s always someone ready to stab you in it. And, after an eternity spent here, you may just find that your own worst frenemy is yourself. So, the moral of all this is: ALWAYS READ THE FINE PRINT. In fact: read EVERYTHING! Be it the work of a long-dead Italian poet ruminating about a fantastical spiritual journey, or a middle-aged wise guy who likes his satire served with a side of groan-inducing puns. So read whatever you can get your hands on, even the bitter and dark because—without that—how would we truly appreciate sweetness and light? Posted in Fun with Heck, Oh Heck! Words from the Author. Guest Blog and Amazon Gift Card Contest 2/13! I will be talking about my newest book Wise Acres: The Seventh Circle of Heck. CONTEST INFO: Open to readers worldwide! RSVP below and get 25 entries to the prize portion of the contest when you show up on the day of the event. If you don’t show up and mention your RSVP your points won’t be entered into the contest. Be SURE to TWEET and FACEBOOK this link: http://bittenbybooks.com/?p=72741 so your friends can RSVP too. Posted in Fun with Heck, Interviews, Interviews with the Author!, Oh Heck! Words from the Author. 1) What was the first piece you ever wrote? Focusing the telescope of attention inward, the haziest memory of early writing I can think of is a gripping, multi-layered piece of fiction entitled “Snoopy Travels Around the World.” It probably won’t come as much of a shock to you—the person on the other side of whatever this is—that this short slab of edgy prose was about Snoopy, and how he…well, traveled around the world. I was probably seven or eight when my pen (or crayon, more likely) produced this genre-defying work. It was basically a list of places loosely held together with the dramatic conceit of Snoopy being bored, venturing forth, then returning home, realizing that he was happiest here all along. I believe some of the places he visited were “France, Italy, Africa, the desert, Mexico…” amongst others. I love the depth of thought that went into “the desert”…I even cribbed the main character. I’m surprised the Schultz estate hasn’t hounded me. Puzzlingly, the story was printed in The San Francisco Chronicle. Really. I ended up working there years later, probably on the merits of this early, disturbing work. 2) Where do you get most of your ideas? Mostly my brain…but then again, look what’s telling me that! My brain thinks it knows everything. It’s like it has a mind of its own sometimes. Anyway, I’m just this sort of living, breathing ransom note comprised of odd scraps of often conflicting things, hastily pasted together to form some kind of coherent incoherence. Sure, I read a lot—mostly nonfiction (here’s a parenthetical statement wedged inside of two dashes: I’m currently reading the first volume in an exhaustive and exhausting history of the Beatles. It’s fascinating, but I just found out that the second volume won’t be published in another six years, when I’ll be in my 50s…my sweet lord…)—I also wage a valiant yet doomed assault on The New Yorker, where I try to keep up, invariably fail, then cancel my subscription until I get another offer where they basically pay me to read it…throwing in a desk calendar or something. I used to be a movie critic, so I’ve spent a lot of time in the dark. I also absorb most every conversation I overhear in coffee shops. So all of this stuff coagulates in my brain pan—baking for a fortnight at about 350 degrees until golden brown—and then I chip it out of the pan and…great, now I’m hungry and I’ve completely lost my way. The point is, I get my ideas everywhere. I think my greatest strength, besides competitive thumb wrestling, is in putting ordinary things together in unexpected ways. I have to make something my own before I’m interested, which is why I’d be a terrible co-author! 3) Who was your favorite childhood author? At first, the Peanuts anthologies, then the Hardy Boys, then Jules Verne, then the Foundation Trilogy by Isaac Asimov, then Dune, then Catcher in the Rye, then Crime and Punishment, and then a book of matches. Probably Roald Dahl, for his wicked sense of humor. Then I got into sci-fi WAY hard. Inhaled most everything that had space ships in it. As a teen, I’d carry around anything by Kurt Vonnegut, even before I fully understood his books, perhaps hoping to absorb them through osmosis. 4) Who do you act out the scenes in your novels with? I’m not sure I fully understand this question, though that has never stopped me before. I don’t really “act out” my scenes (though I have been accused of acting out, especially by my mom). I grab pictures of what I think my characters look like and pin them to a corkboard so they feel more real. I also have to sketch out my various monsters and creatures so I can describe them properly. That way I’m just recounting what I’m seeing rather than writing. The closest I’ve come to acting out my scenes (apart from literally acting out my scenes at readings) was one time when I was driving, which I almost never do as a committed cyclist, and I had a conversation playing out in my head, where it very much felt like two separate people, and I later realized it was Milton and Marlo Fauster, the two protagonists of my Heck series! What they were saying didn’t seem like what I would say at all. They were speaking for themselves! I’m lucky my insurance doesn’t cover meds or I would be out of a job. 5) What is your favorite thing you’ve written? I was sort of a “Johnny come lately” when it comes to writing (as is evident by my use of phrases such as “Johnny come lately.”). As a kid I was really into drawing: mainly spaceships and superheroes (such as The Volt and the ill-named Human Faucet). Later, I was really into music, which was my driving passion up until my early 30s. I used to write stories, though, to supplement my drawings: mainly based on existing properties such as Star Trek. You know: having Kirk and Spock do cool things like destroy entire planets that wore white after Labor Day, or do awesome mash-ups with the Enterprise battling the Fantastic Four. I would also view the burden of writing a book report into an opportunity to use whatever subject was imposed upon me as a launch pad to write what I really wanted to write about. Like when I had to write about the Declaration of Independence. I housed my essay within a post-apocalyptic story where a man finds the document in the rubble of a destroyed building (razed by alien lasers) and, though English had changed so much he could only make out part of it, he gets the gist just as humanity is enslaved by our new alien overlords. It got an A, though that could have been because I used glitter on the cover. I became more serious about writing when I worked at The San Francisco Chronicle. Though I was mostly a messenger, I would review night clubs and books so that I could go to night clubs for free and get books before they were released to the masses. I found that I really enjoyed being published! Oh, and the writing too. From there, I began reviewing movies and became a movie critic, then started my own newspaper in Portland (Tonic), then was an Arts Editor at Willamette Week before being sucked into the Netherworld of advertising. When I look back at my reviews, they remind me a lot of the writing that I did as a kid, where I’d approach a subject as a springboard to talk about something else that sort of relates but doesn’t really. Like when I reviewed Alien 3 and it turned out to be mostly about my difficult relationship with my mother. I think it was the whole “hatching eggs, bleeding acid, and things eating their way out of stomachs” thing. Oh…I almost forgot the question. I think one of the things I’ve written I’ve enjoyed the most was in my newspaper tonic. One was a fake news story of a bunch of dim-witted old protesters protesting the Arboretum, waving signs declaring that Arboretum Is Murder, and another where I did a fake profile on a guy that “tasted” local streets and reviewed them as if he were a wine connoisseur. Anyway, they seemed funny at the time. I’m probably the most proud of my books because, wow, it’s hard to sit for a year and write a book and not have a total breakdown. 6) What scene in your writing has made you laugh the hardest or cry the most? My fourth Heck book, Fibble: Where the Lying Kids Go, takes place in an underworld advertising agency. So I had a lot of fun using my advertising experience for good use, coming up with ridiculous campaigns for products such as “Gee, Your Farts Smell Terrific!” (scented underwear) and flavored soap with a yummy “surprise” in the middle. That stuff cracked me up. In terms of crying, there is a note that Milton’s mother leaves him at the end of the second Heck book, Rapacia, where she is telling him he is not to blame for his sister’s death that gets me every time. 7) What do you think makes good writing? A strong voice, declaring something that hasn’t been declared before, at least not in that particular way. I like experiencing a story through fresh perspectives. The story itself may not even be conventionally “good,” but I enjoy a ride in a new car, going someplace I’ve never been before. For instance, I love Tom Robbins’ Half Asleep in Frog Pajamas, not so much for the story, which I barely remember, but telling that story in second person was so exciting to me as a reader! I love that he took that chance! 8) What made you fall in love with writing? I loved creating worlds to inhabit, as an escape. I think any outcast retreats into their imagination, and that is just one of the many ways that I am not unique. For a time I did it with music, then movies, but then I realized I could have the most control by writing: controlling every aspect of the world I was creating. It probably seriously started for me when I worked the graveyard shift at the San Francisco Chronicle. I would be SO bored that I wrote little stories for my friends on the day shift. Nothing like being alone in a huge building tending countless machines at 3 AM to get your creative juices flowing. They started as funny little anecdotes then expanded into surreal tomes involving all of the people I worked with. 9) How do you beat out your writers block? Of the many problems I have, that is not one of them. In fact, I suffer from having too many ideas, so my books are like high pressure canisters. One day I will relax and not have that anxiety that comes with thinking that every idea you have should be captured. Some, well…don’t. I do, occasionally, feel like my mojo has left the building…that what I’m writing isn’t crackling with creative energy. So I’ll ride my bike. That tends to dislodge the sludge from my brain. Wrestling alligators also helps keep me in the moment. 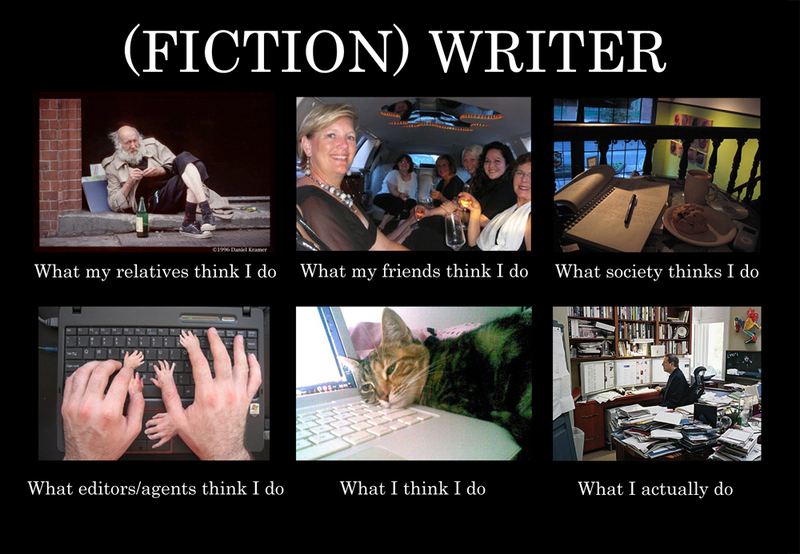 10) Who is your favorite writer? The guy that writes the Emergency Exit signs on planes. Those are very useful. There are so many writers that I am DEADLY jealous of…but, in terms of writing that has always affected me on multiple levels, I’d say Kurt Vonnegut. I mean, every book of his has some wonderful nugget. Like Mother Night (We are what we pretend to be, so we must be careful what we pretend to be.) and Slaughterhouse Five (How nice–to feel nothing, and still get full credit for being alive.). Brilliant. I miss St. Kurt. 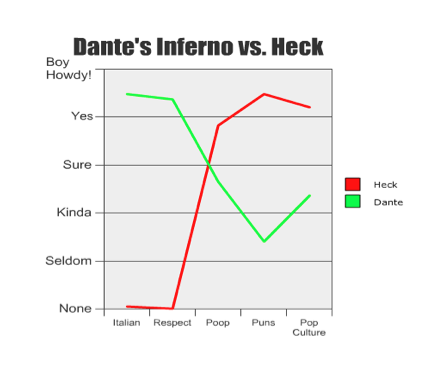 Circles of Heck vs. Circles of Hell -Dale Basye Guest Blog.